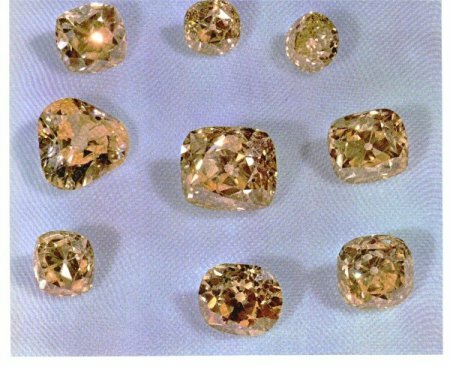 These African diamonds were acquired by Nasseridin Shah on his third trip to Europe in 1889, and are collectively known as the Iranian Yellows. There are a number of collections of large diamonds on display in the Iranian Treasury, however due to security concerns, the largest diamond in this collection, which is a 152.16-carat stone, is not pictured here. The next largest in the collection is the 135.45-carat stone in the center of the photo. This is rather amazing, considering the Regent Diamond, one of the world's most famous, weighs 140.50 carats. Three of the other diamonds shown here are between 114 and 120 carats each. 23 — 38.18 carats; multi-faceted trapezoid cut; colorless. None of the diamonds are a saturated yellow color, but rather a light yellow. If they were graded by GIA they would probably fall in the L-M-N range of the color scale. However, due to their immense size, their yellow color is more noticable than if they were smaller stones.